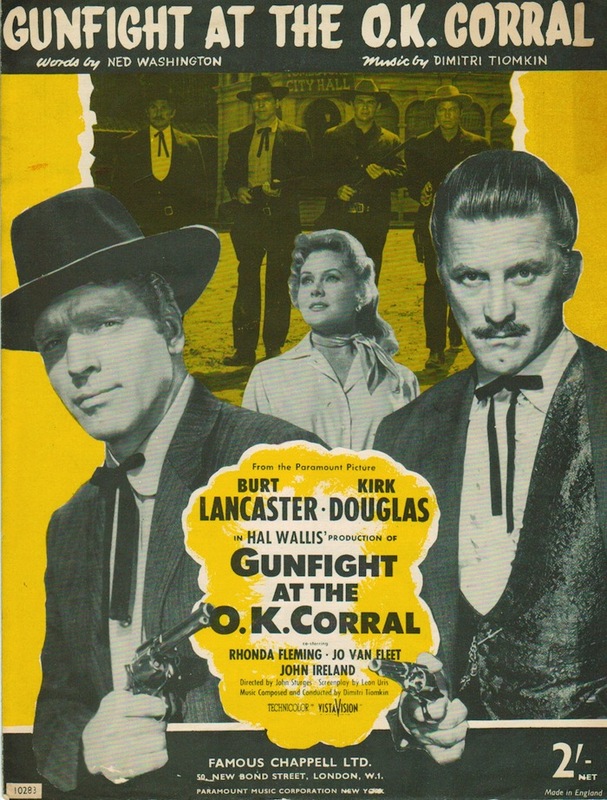 50s Westerns DVD News #170: The Best Of 2014. | 50 Westerns From The 50s. I was hoping Border River would make the list. It’s fantastic. It made its way to the discovery list, which is coming up tomorrow. This is a fantastic list, Toby. 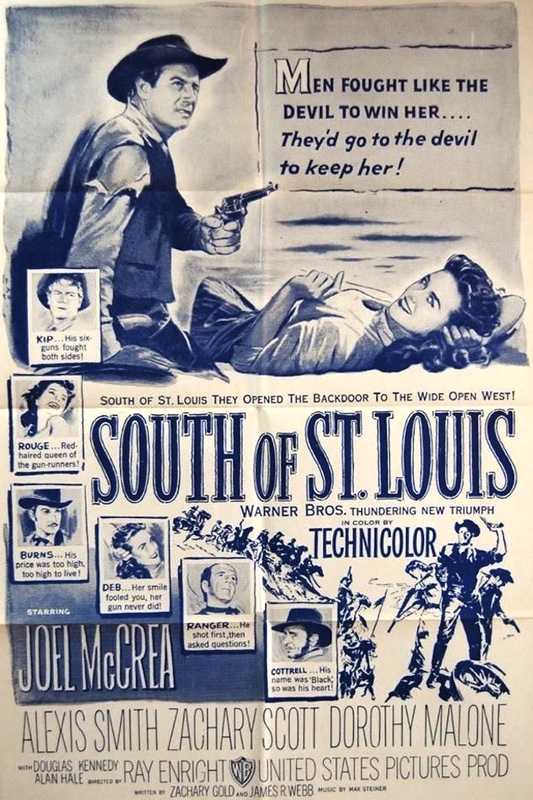 I need to watch my copy of SOUTH OF ST. LOUIS *soon*. Love seeing the love here for PANHANDLE and GUNSMOKE IN TUCSON which were fave discoveries of the last couple years. And Tim too! Hope lots of folks will check these great releases out. Well, last night I started on my “catching up” list. I saw 2 that have often been talked about. GUNSMOKE IN TUCSON & QUINCANNON, FRONTIER SCOUT, one from the Official Release list and one from the TV recording list. One reason I chose GUNSMOKE IN TUCSON first to watch was Mark Stevens. I really loved JACK SLADE and I was anxious to see another Stevens western. This was quite a different Mark Stevens, he was very laid back, quiet and almost half asleep throughout the entire movie except for a couple of brief bursts of action. In JACK SLADE he was on the verge of explosion throughout the entire movie, here he’s the opposite, on the verge of napping throughout the movie. This movie also involved a small plotline that I really don’t like, the innocent man framed by the evil big boss character of a crime he had nothing to do with and now the entire town is against him and he needs to be on the run and hide, I just don’t like this oft used plot, thankfully it only happened in a small portion of the movie. Surprisingly, the evil mastermind in this one was Vaughn Taylor, usually he plays the friendly Dr. or a townsman or a banker, I have seen him play bad guy, but rarely. He makes a good if slightly unbelievable bad guy, esp. when he is supposed to have stolen Stevens girl, I just couldn’t imagine this bawdy red head going for this wimpyish bald old man instead of sticking with Stevens (who was scarily extremely thin too). Stevens must have weighed 100 pounds, I have to say I like my cowboy heroes with a little more beef, not muscles but girth. Stevens looked like he could blow away with the wind. OK, those were the negatives, the positives, it was in beautiful color, I love ’50’s westerns when they’re in color, this is part of my reason for being a fan of this genre, ’50’s westerns. Color was bright and glowing from the screen, the red headed saloon girl’s hair, the blue skies, the skin tones it all radiated, I loved it, unabashed beautiful bright color. The story itself was interesting, Stevens a man trying to prove to maybe just himself that he’s on the side of the good now. I don’t think he cared about proving this to anyone else, least of all his opposite brother, Forrest Tucker (who was very good in this film) who he resented. Stevens’ character was a brooding quiet man with a plan, no one could talk him out of it. He knew what he wanted and he went about getting it, no matter who was opposite. It was an enjoyable movie as it was a more or less typical ’50’s western, I like that type, so I liked this movie. It wasn’t anything particularly great or memorable, let’s just say it was no JACK SLADE, which was one I still vividly recall, but it was one I’m glad to have seen and as a typical ’50’s color western, I’d watch it again, there’s just nothing special or unusual about it. QUINCANNON, FRONTIER SCOUT was one I chose just because Peggie Castle was in it. Here she was really beautiful looking wearing a very memorable low cut blouse and whose blonde hair shined brightly. She was spunky in this one, like I like her, she was tough (something she seems to be in westerns, as opposed to a victim which she plays in noirs). She looked beautiful in color and this movie was another beautiful color western from the Bel Aire studios, no less. Usually they make b/w cheapies, here they put up the coin to make a color cheapie. I really all of the cast here, the only one that seemed out of place was the main star, Tony Martin. It was a pleasure seeing John Smith here, as I’m now into the final season of Laramie on Friday, unfortunately he was a bit of a bad guy here, I like him better on the other side. But so many great familiar faces, John Doucette, one of my favorite Superman bad guys, here he’s a good guy, another change from their usual characters. A very young Ron Randell, who when he got older I thought looked a lot like Ronald Reagan, here Randell’s a sneaky character, I’ve seen him as bad and as good guys before, I like him better too as a good guy. Morris Ankrum, always fun to see and Sherriff of Cochise, himself John Bromfield as Tony’s reluctant partner. A good cast, a bright color movie, a beautiful Peggie Castle and aside from a greasy haired unlikely scout, Tony Martin, a great movie that was fun throughout. C’est toujours un plaisir pour moi, de lire un post sur Mark Stevens, je suis fan de cet acteur. 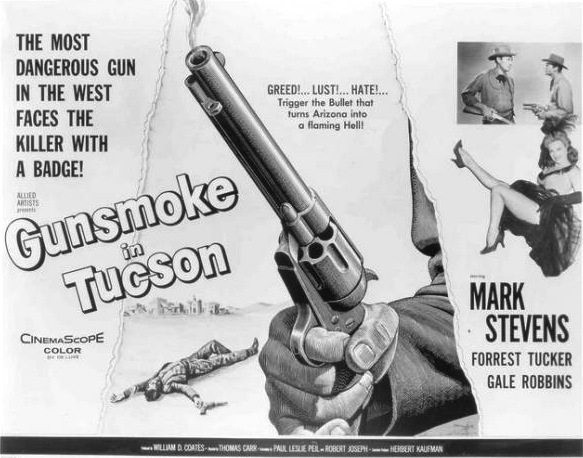 D’accord avec Johnny Guitar, GUNSMOKE IN TUCSON est un petit film, qui par son sujet, ne vaut pas JACK SLADE ou GUN FEVER, deux westerns autrement plus originaux, malgré leurs maigres budgets, mais Mark Stevens est vraiment bien. A different look, Mark Stevens ? that’s right, sa façon de marcher, légèrement courbé, son allure tendue et sa nervosité palpable, sont uniques.